In some way or another, for me music has always been a kind of journey; away from everyday life and its worries or just away from the constant buzzing of the mind. Furthermore, I have always been attracted to many styles of music, and especially various types of world music, as a listener on one hand and then of course that aspect is directly reflected within my career where I take the concept of traveling with music much beyond the idea of escape to a main trait of my personal signature as a performer and even moreso as a composer. Throughout the years of my musical journey I have both built a repertoire of wide variety of genres and cultural inspirations as well as incorporating these different flavors into my own compositions. This has often been somewhat frustrating for me, as I have felt that I needed to choose a certain identity as a performer at the expense of another. That is until I created a concert series specifically tailored to embrace all my musical passions, inspirations and aspirations. Such a concert therefore offers a taste of my own musical journey from my homeland where I grew up learning classical music, to New York where I lived for quite some time to pursue jazz , with all the flavors of world music that I have been exposed to in its rich environment as well as in my various “actual “travels ( I do like to travel for real as well!). 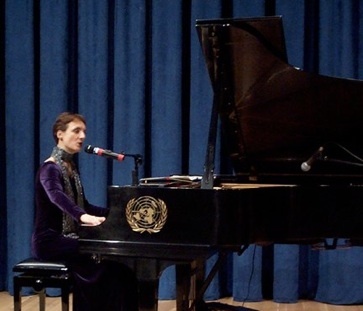 The program can include classical pieces such as Ravel and Debussy, with a spanish touch such as Albeniz, tangos by Astor Piazzolla, some known and less known standards from jazz and latin jazz composers among Thelonious Monk, Bill Evans, Keith Jarrett, A.Carlos Jobim…as well as a splash of Flamenco jazz oriented pieces. It also encompasses French songs or melodies from Jacques Brel, Boris Vian, Michel Legrand or even Francis Poulenc often readapted in original jazzy arrangements and finally original compositions of basically all styles mentionned above. The vocal pieces would typically include songs in french, english, spanish, italian, portuguese and even arabic.